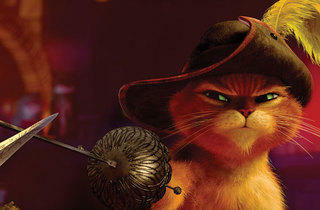 Beautifully voiced by Antonio Banderas, Puss in Boots is to ‘Shrek’ what Jack Sparrow is to ‘Pirates of the Caribbean’ – a rogueish, charismatic scene-stealer who belongs centre stage. 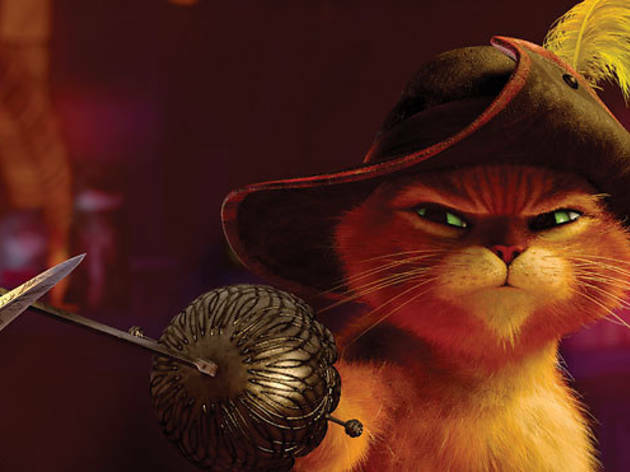 This spin-off – effectively a prequel – sees outlaw Puss returning to rural Spain, where he joins childhood friend Humpty Dumpty (Zach Galifianakis) and feisty feline Kitty Softpaws (Salma Hayek) in an attempt to steal the magic beans from Jack and Jill and find the goose that laid the golden egg. The plot is drawn out and lacks emotional impact: the whole trip up the beanstalk feels like filler. But plenty of irresistible set pieces have charm to spare, whether it’s a cat dance-off in a seedy barn or a flashback to Puss’s youth when he is – cute alert! – a huge-eyed little kitten. As ever, much of the humour mixes anthropomorphism with well-observed reminders of Puss’s feline status: watch him lap up a hard shot of milk with glee. ‘Puss in Boots’ is uneven, but when it’s on course, cat fans will be in heaven. Great. Took my four year old little girl and she loved it. For such a negative tone in the review I am amazed it got 3 stars. It starts well and the chemistry between puss and kitty is great but apart from that the film is a disappointment. Humpty's character is poor and the supposed change in his character is all to symptomatic of a Hollywood focus group. The studios must try harder. The film is too long and the plot what it is is too thin and strung out. Like Tintin a disappointment from film makers who should know better and seem to be going through the motions. 2 stars only I am afraid. Its ok and it will keep kids occupied but that is it. Its is fair not good and sadly much more could and should have been made of this. The animation is wonderful, the cat characters cute, the plot pretty random. Not enough catness going on and too much Humpty. Also, the comment 'cat people are crazy' seems a bit odd coming from a character who seems specifically to have been designed to appeal to 'cat people'. Nevertheless, I enjoyed this, mainly because of the look of it, and the central performances, particularly Antonio Banderas.